From left to right: Ami Klin, Laura Klinger, Francesca Happé, and Joe Piven. My fiancé, Manny Casanova, and I just finished attending this year’s International Meeting for Autism Research (IMFAR) 2014, held in Atlanta, Georgia. Every year I really look forward to this because it’s a great opportunity to share one’s newest work, an even better opportunity to learn about other peoples’ work and get new insight one wouldn’t have otherwise gotten cherry-picking through publications, and a great time to meet new people, make new connections, and– hopefully– even build one’s network of collaboration. 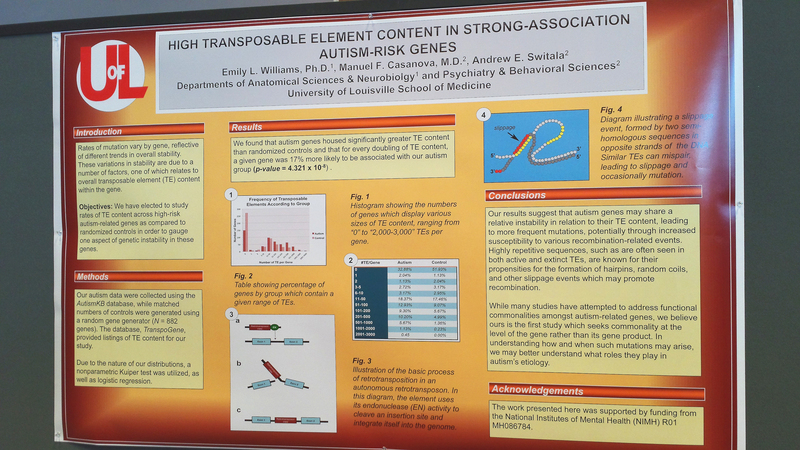 This year I had the great pleasure to present my own preliminary work on transposable element content in high-risk autism genes. Many of you probably already have some idea of what that research is about, but just in case, read here for a review. And below is an image of the poster. I won’t go heavily into an overview of what went on at the meeting but instead focus on a few things that really caught my attention. Dr. Efrain Azmitia gave a presentation titled, “Persistent Cortical Angiogenesis and Neuronal Migration in the Young Autism Brain”, which I thought had some great potential. He has found that in the young autistic brain, ages 2-8 years, there are persistent signs of angiogenesis, or the branching of new blood vessels. 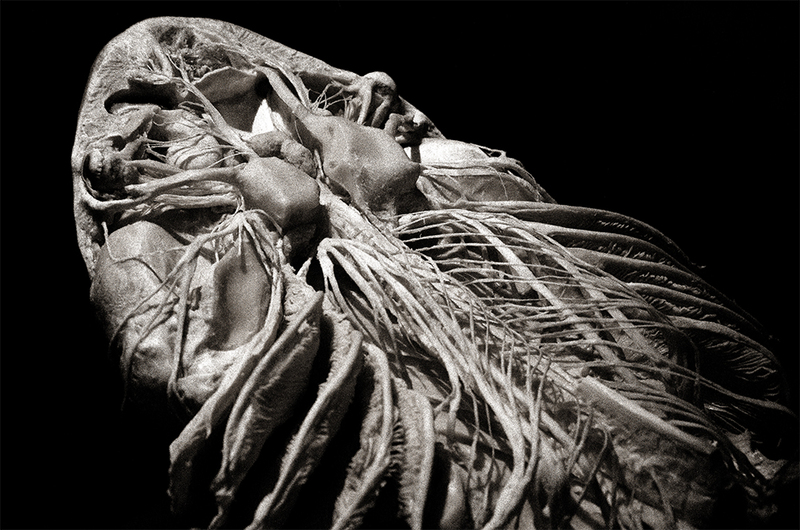 Looking at the images which, sadly, I don’t have copies to reproduce here, I can tell you that the differences in vascularity were striking. It poses interesting questions as to how neural and vascular developments may be affecting one another in autism (e.g., this study). In addition, Azmitia noted that autistic brains had greater intensity of vimentin staining, which is an immature filamentous protein which typifies neural progenitors and is replaced by neurofilament in post-mitotic neurons . This in particular is suggestive of altered neural differentiation or maturation in the cases he studied. It will be interesting to see this publication and future replications to determine what percentage of autistic brains might share this characteristic. 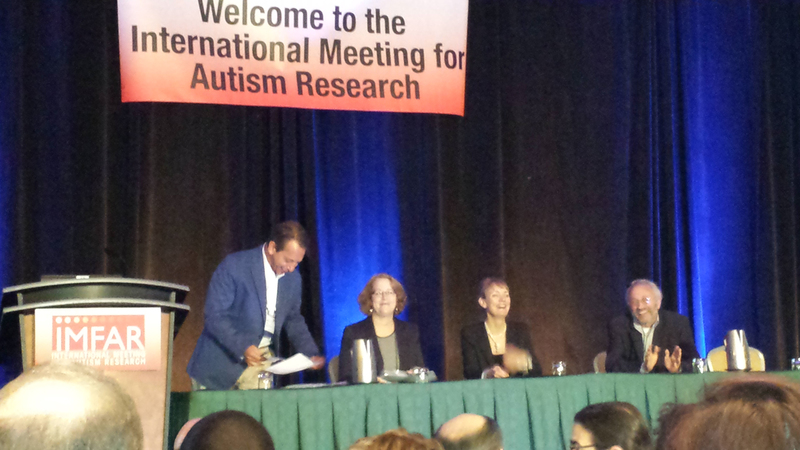 Another excellent presentation I attended was given by Dr. Daniel Campbell from University of Southern California, Los Angeles, entitled “Further Evidence that Non-coding RNAs Contribute to ASD Risk”. This got me particularly riled up, in a good way. Campbell talked about the potential importance of long non-coding RNA (lncRNA) in the etiology of autism. He gave, for example, the case of Cadherin 9 and Cadherin 10, two genes which are included on the core list of autism-risk genes (i.e., “high risk”) and lie immediately adjacent to one another in the DNA. Mutations in autism have consistently targeted the space between these genes, and because science has been so heavily focused on gene products that produce proteins, we’ve assumed that the genes of importance in this region were the cadherins. However, his lab has found that the targeted region actually codes for a lncRNA, itself which is antisense (complementary) to the protein-coding Moesin gene, which is on a completely separate chromosome . It is believed that this antisense gene, a pseudogene of Moesin, helps to regulate the latter’s transcription. 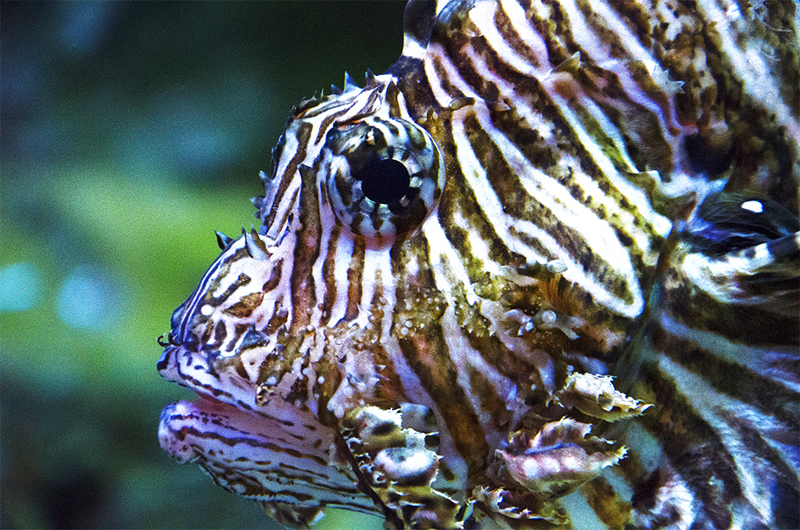 They have found that, while the cadherin expressions don’t appear to be affected in autism, the expression of both this lncRNA transcript and Moesin in fact are. He gave this and other examples of potential lncRNA involvement in autism and reminded us that proteins make up only about 40% of the transcripts, meanwhile RNAs are the bulk of the cell’s gene products. His talk of course got me VERY excited because whenever you say the word “antisense” or “pseudogene”, immediately I start asking, “How are transposable elements involved?” because mobile elements have been big drivers of antisense regulation as well as the evolution of lncRNAs [3, 4]. I should point out that in citation #3, the authors list HERVs as highly enriched in lncRNAs, even though LINEs and Alus have been comparatively more successful in our ancestral genome in terms of sheer number of insertions. And speaking of HERVs, I met up with Sinibaldi-Vallebona’s group and had a nice long nerdy genetics chat with them. They’re the group who has reported increased HERV expression in the blood of autistic individuals . I spoke at length with Laura Ricceri, who has been handling the animal studies for the group, looking at HERV expression in two mouse models of autism, the valproic acid and the BTBR models. They’ve found that HERV expression is upregulated in both of these models, laying a lovely groundwork for future molecular and human studies. I’m very excited by their results and look forward to some potential collaborations in future. And I also look forward to seeing how their work might complement Campbell’s lncRNA studies. I could believe very easily that these two groups might be studying different sides of the same coin. On the more social side, Manny and I also spent a great couple of hours chatting with John Elder Robison over lunch about repetitive Transcranial Magnetic Stimulation (rTMS), for a book he’s writing on the subject. (For anyone traveling into Atlanta and near the Peachtree Center, The Corner Bakery is a great little soup and sandwich shop, I definitely recommend it.) Anyways, John’s a great guy, has been a patient of TMS himself, and is a big proponent of the therapy (part of the point of the book). So we really look forward to seeing him again in future– and to reading the book! And, by the way, if you haven’t already read his biggest hit, Look Me in the Eye: My Life with Asperger’s, you can buy it on Kindle now for $2.99 for a limited time, so go! And finally, to treat ourselves for our hard labors (–who am I kidding? I love science conferences! 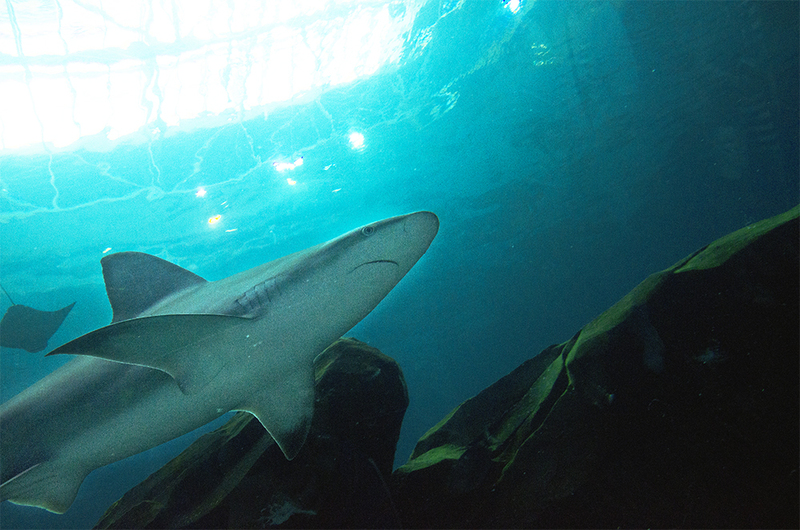 ), we went to the Atlanta Aquarium and Natural History Museum, so here’s some of my photography in our downtime. 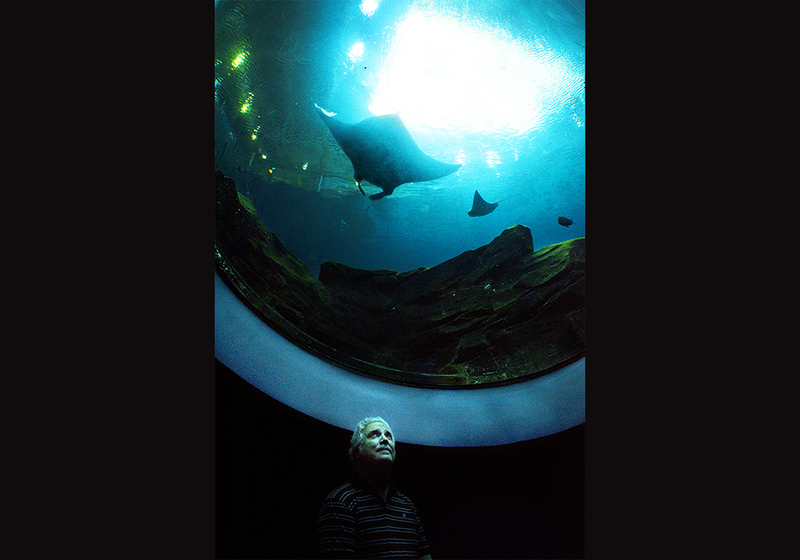 Manny gazing up at the manta rays. 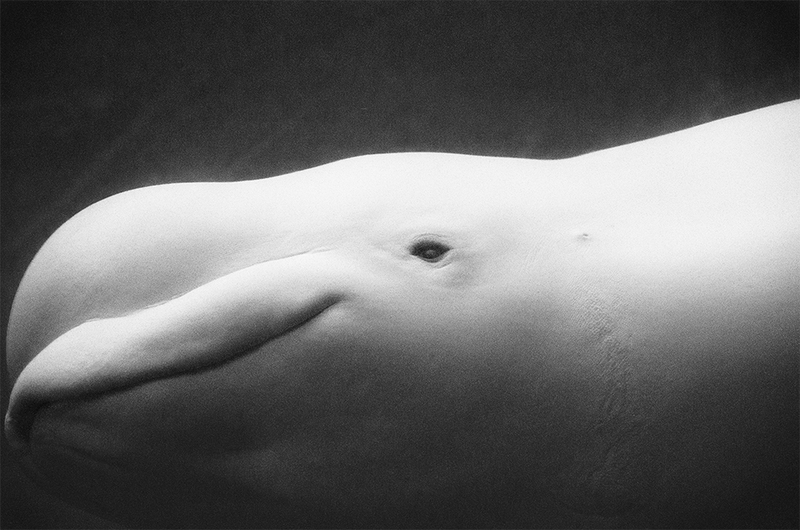 Close-up of a beluga whale. A dissected and plastinated (embedded in plastic) nervous system of a shark. This exhibit was phenomenal. Whoever did this was an extraordinarily talented and experienced anatomist. 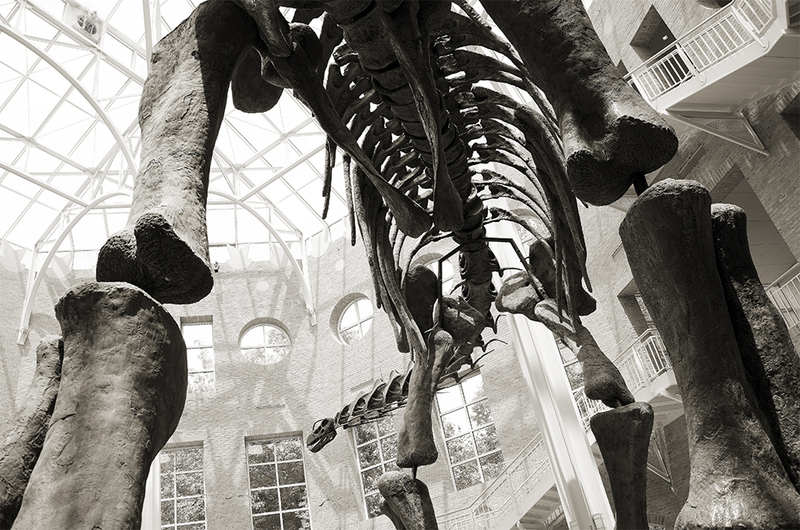 This image was taken at the Fernbank Natural History Museum. It’s a model of the Argentinosaurus, one of the largest land animals to have ever lived. Truly not trying to be rude here, but the same Dr. Manuel Casanova that is speaking after Andrew Wakefield at the upcoming AutismOne conference? I’m just a little confused– Dr. Casanova that you have as a guest blogger is brilliant and does completely legitimate research… Why would he speaking at a conference where folks think that Vaccines, GMO’s, Fluoride, etc. cause autism? I mean, this is total crankfest. I just had “WHOA” moment after looking at the lineup for the upcoming conference. Yes, Manny has attended AutismOne for a number of years now. The way he describes it is that he hopes that in talking about the science, he might reach some folks, particularly those who aren’t militant in their beliefs of vaccination, etc., and may be more open to listening to what he has to say. Also, he’s generally very cordial and has a hard time saying no to invitations and they’ve consistently asked him back year after year. He says, some of the pseudoscience aside, it’s actually quite a fun conference. Thanks for the response, Emily, and kudos to Dr. Casanova for his efforts. I’ve been visiting here for quite some time– your blog is wonderful, and you’re a very talented writer. Thanks for the work you do. On a related note, I kind of find it queer they continue to invite him, considering the last two years his talks (which are generally pretty heavy science) have been slated at the same time as Jenny McCarthy (last year) and Andrew Wakefield (this year). He says he’s lucky if he gets 10 people. But I suppose if he makes sense to at least one person, the trip was worth it. It’s ironic that ultrasound, somewhat similar to the use of high-power magnets in therapy, has gotten a pseudoscience rap. Which is a shame. If people, including medical professionals, knew all the things ultrasound can do and how it works, I doubt they’d consider it pseudoscientific at all. I’m not judging one way or the other, and as I mentioned in the comments of Orac’s blog, I was just shocked to see someone that does legitimate autism research speaking at such a cranky event. Just watched the video of Dr. Casanova’s presentation at A1. Thumbs up. I did appreciate how he prefaced his presentation by essentially saying the believers in a vaccine/mercury/autism link and magical biomed treatments will be more comfortable across the hall. Hehe, you should see his recent post on Wakefield. He’s gotten a LOT of flack via email and a number of people unfollowed his blog. Great post from Dr. Casanova! Indeed the poo flinging of boy blunder is always an exciting encounter. I’m still not sure how he considers himself an epidemiologist. I always try to avoid poo flinging, lol. Such a messy affair. Casanova is on the right track. 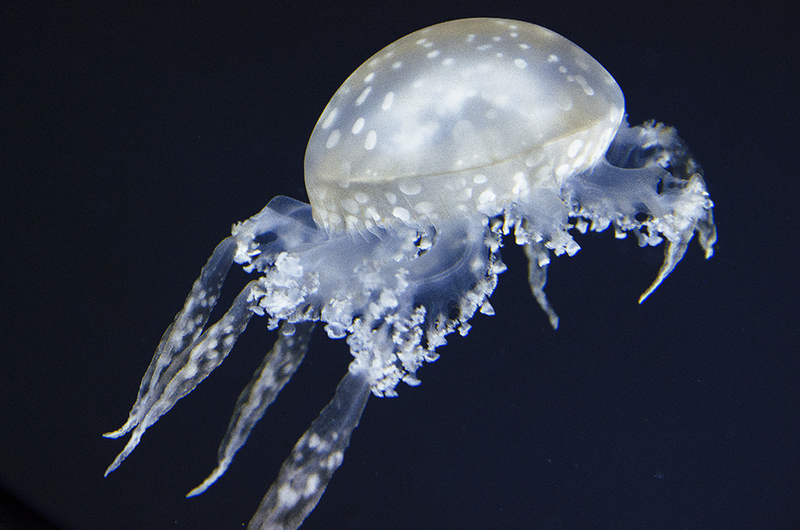 It is well known that animal and cell studies show ultrasound caused bioeffects. What has been lacking until now, are the confirming human studies, which I have recently found and complied as a bibliography. Search “Jim West” “human studies.